The Kentucky Derby (official site link) is widely considered the most popular horse race in the world and without question the United States. The Kentucky Derby is the first race in the United States Triple Crown of Thoroughbred racing and takes place every year in early May at Churchill Downs racetrack in Louisville, Kentucky. The race is often considered “the fastest two minutes in sports” because the distance of 10 furlongs (1.25 miles) generally takes the horses around 2 minutes to complete. The purse for the race is $2,000,000 with $1,425,000 going to the first place finisher. This massive purse is twice as large as either the Preakness or the Belmont Stakes. With this massive following it should come as no surprise that the Kentucky Derby is the most attended horse race in North America every year. I would recommend that USA residents bet on the Kentucky Derby at Bovada.lv, our favorite online sportsbook for betting on horse races in the United States. Bovada is the American facing branch of the popular Bodog Sportsbook brand, and with this comes a great deal of respect and trust within the industry. Bovada also offers a great 20% free bet bonus up to $100 that can be used on the Kentucky Derby and they also offer 3% rebates on all straight horse racing wagers and 5% rebates on exotic wagers. Learn more about Bovada.lv with out full racebook review. If you live outside of the United States then Bodog.eu is the best place to bet. The website and software looks the exact same as Bovada, but residents of other countries are able to set up an account. Bodog also offers the 3% and 5% horse racing rebates, but their sign up bonus is a 10% matching bonus with no maximum. Regardless of whether you are from the United States and are signing up at Bovada.lv or from elsewhere and are opening a Bodog account the process and layout of the site are the same. First you should click on of the links on this site and open a new account at either sportsbook. After creating an account you can proceed to make a deposit in order to have money online with which to bet on this years Kentucky Derby. Now that you have funds online you are ready to bet. If it’s the day of the race then you should click on the ‘Horses’ tab to head over to the racebook. There you can click on the ‘Churchill Downs’ racetrack in the left sidebar and find the Kentucky Derby race. The post time for the Kentucky Derby is generally shortly after 6pm EST. Place your win/place/show, exacta, trifecta or superfecta bets in the racebook. The Kentucky Derby is such a huge betting event that you will also be able to find fixed odds in the sportsbook leading up to the race. Click on the ‘Sports’ tab in the top navigation bar and click on ‘horse racing’ in the left sidebar to see the odds for the Kentucky Derby and to place your fixed odds bets. These bets are different than the parimutuel bets you would be placing at the racebook on the day of the event. 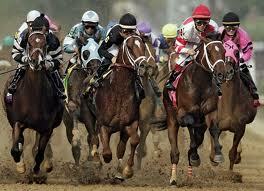 The Kentucky Derby race was first run on May 17th, 1875 in front of a crowd of approximately 10,000. This inaugural Kentucky Derby was won by a colt named ‘Aristides’ after being trained by Ansel Williamson, a future Hall of Famer. The Derby was originally 1.5 miles long, as it was modelled after England’s Epsom Derby. In 1896 the distance was adjusted to the current distance of 1.25 miles or 10 furlongs. Although the race was initially successful, it wasn’t until 1902 when Matt Winn of Louisville and other investors acquired the Churchill Downs that the Kentucky Derby really took off and became the most important race for three year old Thoroughbreds in North America. The fastest ever running of the Kentucky Derby was done by well known race horse Secretariat, way back in 1973, with a time of 1:59.40. There has only been one other recorded time of under two minutes, which was by Monarchos in 2001 with a time of 1:59.97. To learn more about the history and traditions of the biggest horse race in North America, check out the Kentucky Derby Wikipedia page. The Kentucky Derby is one of those events that really beggars belief when you consider how popular it is versus the duration of time it actually consumes. The running of the Kentucky Derby, which takes place on the first Saturday of May, lasts around two minutes, or five if you want to count to opening gate dialogue and build-up, yet the race is capping off a two-week event held in Louisville every year. And not only does the Derby attract the world’s rich and famous, and your everyday fan of horse races, but it also attracts the gambling crowd. You might not think so, but the Kentucky Derby easily rivals every other American sporting event, save the Super Bowl, in terms of money bet on the race. And that part of it does make sense. After all, you’re dealing with 20 horses, a wide range of odds, dozens of different betting structures, and probably the single largest amount of proposition wagers outside of the World Series of Poker. Gambling and the Kentucky Derby go hand in hand today. But what if you’re not an expert gambler in the genre? Well, do not feel as if you need to be left out simply because you’re not a pro in the gambling world. Listed below, we’re going to go over five very simplistic steps to help you bet, and hopefully win, on the Kentucky Derby. If you can follow some simple language and resist the urge to fly solo like you’re rolling the dice, you can make an educated, safe bet on the Kentucky Derby and potentially end up winning. Although simple to comprehend, this step may actually take you a while. And that’s because we want you to become relatively familiar with how the race works before you branch out and bet. This means understanding how many horses run in the derby (20) but, more importantly, understanding their odds. We’re going to list the odds below of all 20 horses racing in the Derby, so don’t worry there. But before we get to that point, we’re going to explain what the numbers mean. On the television, you’ll see a horse that’s going off at 4:1, or four-to-one, and this literally means that betting $1 will win you $4 if that horse wins. But the odds you’ll find on a sportsbook will have that horse listed at +400. Don’t worry, though; this is a different way to say the same thing. At +400, $1 still wins $4. And as you will see, you can find everything from odds-on favorites to ridiculous underdogs that would make you wealthy if you hit! Just take a while to research the race format and the bets before you go any further. The next step here is to find yourself a reputable sportsbook. Now, you have two basic choices here. One, you can check out our other material throughout our extensive gambling network to find a great location with which to bet. Two, you can put in the time and research yourself to find a good sportsbook. You’re looking for a sportsbook that has a variety of odds, great security, plenty of payment options, a great reputation, simulcast racing events, and more. You may want to stick around and bet on more than just the Kentucky Derby, so it’s important to find a site that hits all the high points. Also, be on the lookout for lucrative bonuses and promotions. Some of the best sportsbooks will offer cashback options on races like the Kentucky Derby and will generally offer you a nice deposit bonus for signing up. These are the 20 horses that are suspected to run in the Derby this year, if all holds to form. There are actually around 30 horses listed right now, but not all of them will run. These are the horses with the best odds, and as you can see, some of them are definitely long shots. Once you get past 20:1, you’re dealing with a double-edged sword: One edge is big money if you win, the other is the fact that it’s highly unlikely you will win. Our recommendation for people new to horse betting is that they keep it very simple by placing a straight bet on a horse to win. To put it simply, this means picking a horse you think will win and placing a bet. We emphasize this simplicity because horse betting can be very tricky. You have daily doubles, parlays, trifecta tickets, objections, minus pools, show bets, place bets, underplays, and much more. This can all be incredibly confusing for people who haven’t become familiar with the genre. So, to start out with your betting, go the simple route and try to pick a horse you think will win. After picking your horse, or horses for leverage, you need to decide what to bet. What we recommend here for the Derby is the 10% rule. E.g. if you have $300 in your sportsbook account, do not bet more than 30% of that, i.e. $30. Now, this isn’t set in stone or anything; it’s a general rule to help you hold on to the majority of your money. And any way you slice it, you’ll get paid off nicely if you do win. By the time the Derby kicks off, the average odds on favorites will be around 4:1, so even if you’re only betting $20, this would be an $80 payoff if you win, though only a small 10% hit if you lose. That’s the idea behind betting conservatively. We cannot tell you how to bet, but you’ll be able to make many more bets by going with the 10% rule, and it won’t take you long at all to build a healthy stack if you start winning. This was a simple guide to help you bet wisely on the Kentucky Derby. For a complete rundown of the Derby, including its history and other details, we have other pieces in our network that will help you get a handle on it all.